Last lifting season is a prime example of just how much business Havator books for the CC 2800 crane. Over a relatively short period of time, the company moved the versatile Terex crane three times, logging over 350 km (217 mi), for three very different applications. Havator first used the crawler crane in an industrial application, changing 62-tonne (68-US-ton) process washers at a paper mill in Pietarsaari, Finland. Crew members then loaded the crane on 15 trailers, plus three heavy haulers for the crane superstructure and crawlers, and led the convoy 250 km (155 mi) north over a three-day journey to Oulu for changing electric plant filters at the Toppila Power Station. The third leg of the trip saw the crane moving another 100 km (62 mi) north by land and then barged to an island for a windmill project to switch out turbine gears. One of the largest peat-fired power stations in the world, the Toppila Power Station generates 210 MW of electric power and 340 MW of thermal power. The four massive air filters pull from the airstream the particulate matter generated by the peat-burning process. The filters are changed on a 20-year cycle. “The filters are typically covered with dust, rust and other items, which can increase the filters’ weight,” comments Simola. Since space was at a premium at the electric plant site, Havator chose the short boom/jib configuration and worked at a relatively narrow radius, ranging from 24- to 27-m (79- to 89-ft). “At the minimum radius in this configuration, the CC 2800 crane offers a lift capacity of up to 227 t (250 US tons) and 205.5 t (226.5 US-ton) capacity at the maximum working radius, so we built in extra lift capacity to account for the possibility of additional weight with the used filters,” adds Simola. Once on site, Havator’s rigging crew took just 2.5 days to set up the crane. This included additional steps required to meet the strict 15 t/m2 (1.5 US-ton/ft2) ground load pressure limit. Even though the crane’s weight is spread over its large crawler tracks’ 31-m2 (332-ft2) area, the CC 2800 crane could not reach the relatively low load limit for the job. “We had to strictly adhere to the ground load pressure limit, because of the risk of damaging the many pipes and canals running under the ground,” explains Simola. “We placed multiple special kinds of pontoon plates under the lifting/driving area. They are approximately 6.5-m-long by 3.5-m-wide by 0.6-m-thick (21.3- x 11.5- x 2.0-ft).” For contractors that often face applications with low ground load pressure restrictions, Terex offers 1.8-m (4.9-ft) wide crawler tracks, so weight can be disbursed over a wider area. Over the next week and a half, Havator’s two crane operators, supervisor and radioman used the Terex CC 2800 crawler crane to perform the eight major picks – four to remove the old filters and four to install the new – and several minor lifts. “We had to carry the load of the old filters over a distance, so it was necessary to use the crawler crane,” says Simola. The used filters were placed on a special Havator trailer that carried them over to the assigned storage location, approximately 300 m (984 ft) from the lift area. The CC 2800 crane performed flawlessly removing and replacing the 20-m-long by 10-m-deep by 20-m-high (65.6- x 32.8- x 65.6-ft) filters. “Everything went well,” says Simola. 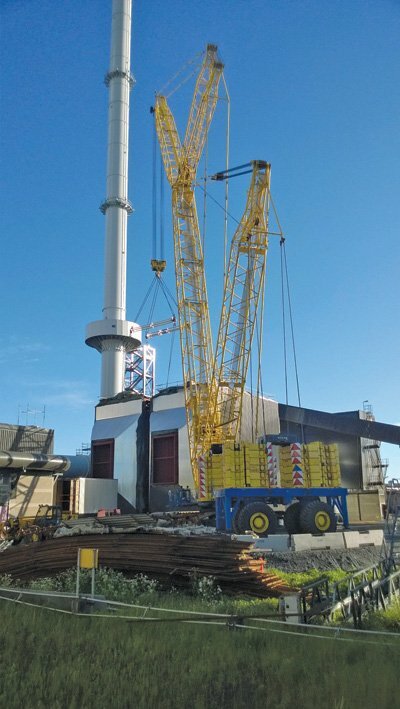 “We worked according to plan and completed the job on time.” Then the crews quickly dismantled the crane, loaded it back onto the 15 trailers and three heavy trailers, and moved it to Kemi for the windmill project.